As soon as you board your first flight, start adjusting to your new time zone. What I mean by this is sleep when it’s nighttime at your destination and stay awake when it’s daytime. More often than not, the airline will help you do this by turning off the lights at the appropriate time, but you can help yourself by preparing for your flight, as well. On our most recent trip to Thailand, Jordan and I prepared for our flight by staying up the whole night before. In all honesty, I didn’t quite make it the whole night, but the sleep deprivation definitely helped me to sleep on the plane when it was 9pm in Thailand and 9am in America. Granted, not all of your trips will be a complete turn around like that, but it’s still a good practice to think ahead about your flight and how you might best start preparing to get on that timezone, starting with your flight. I’m not one that can easily sleep on a plane, so I really dread the long plane rides, especially when people give me the advice I just outlined above. I have a few things that have really helped me to get a few hours of shut-eye that I’d like to share with you! I think a good eye mask is key to getting some sleep on the plane. While they do dim the lights, there’s always a few people who are reading or watching movies, and that light might impede your ability to fall asleep. I cannot travel without my Bose QuietComfort Headphones. It’s amazing what they can do for reducing the amount of “airplane noise,” thus allowing me (and my ears) to really relax. I’ve been using a standard neck pillow for my last couple of trips and I’m ready to upgrade to this one because I’m just really tired of my head flopping over and waking me up. United MileagePlus Explorer Card: With this card from Chase, you get two one-time passes per years to United Clubs and participating Star Alliance lounges. Chase Sapphire Reserve: One of the best travel cards out there, you’ll get access to Priority Pass Select, a great network of lounges across the globe, and even offers dining credit at a lot of airport restaurants (just remember to eat on your new timezone’s schedule). American Express Platinum: Another great travel card; this one gives you access to Centurion Lounges, Priority Pass Select, as well as Delta SkyClub Lounges. While travel plans (and derailments) need to be taken into account, try to make the first day of your trip one that you won’t want to sleep through! If your plane lands in the morning, plan to walk around the city for a good while. Familiarize yourself with the lay of the land, get to know the culture. Today is the best day for finding that perfect coffee spot (did I mention… drink some coffee!) near your hotel. Jordan and I always try to make dinner reservations on the later side, so that even if we are super tired, we have something fun and exciting to stay up for! Push yourself to be up and active all day, and especially to be outside, as the natural light is excellent for fighting jet lag. If you need to take a nap, allow yourself to rest for 30 minutes to an hour. The first time this happened to us was our honeymoon, when we arrived in Thailand around 9 pm or so (I’m not so sure about the time, it could have been any time, we had been traveling for, what felt like, four days). Anyway, even though it was late by the time we got to our AirBnB, we wanted to get some fresh air and walk around, and make sure we stayed up as late as possible, as the time difference for us was 12 hours (we became nocturnal). 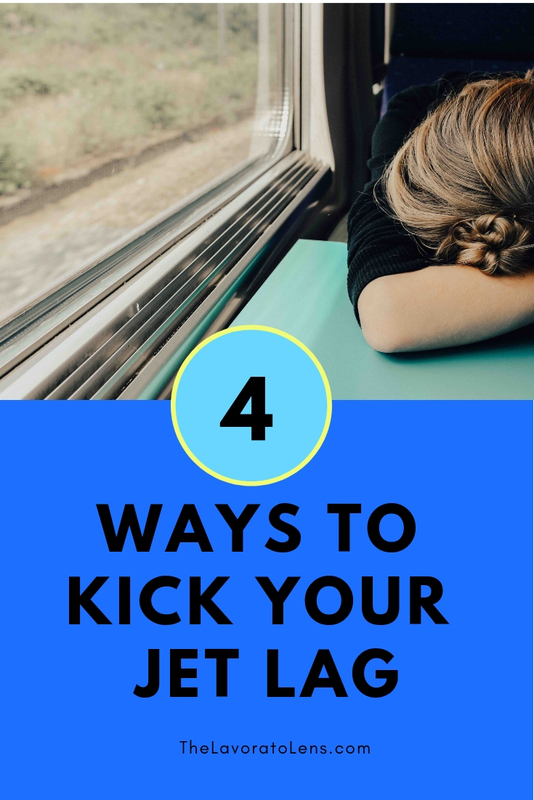 This was probably the hardest jet lag for me to overcome! If you are arriving to your destination in the evening, I highly recommend you stay up as late as you possibly can, so you don’t wake up early in the morning. Now, follow my recommendations for arriving in the morning! The same things matter: exposure to sunlight, staying active, etc. Arriving in the night means you don’t have to worry about travel delays, so go ahead and book a tour or activity for the morning time - something that will make you want to get up and out of bed! What do you do for kicking the jet lag? Let me know in the comments! Also, make sure you are following me on Facebook and Instagram, so you can get a daily dose of travel inspiration!